You've been looking for your dreamboat now for months, you finally found it. What do I do next... So here are some Tips that the ordinary person can use to check out his future boat. Tools you'll need: Ice Pick, Small Ball Peen Hammer, Wrench, Digital Camera. Take photos of the boat. Inside, outside, all around the boat. It's a digital camera, you can take hundreds of them. What's good about this is that you may catch something that you missed when you where checking out the boat. People get to excited about buying the boat and something could be staring them right in their face and they can pass it right up. So in the evening go on your computer download the photos, expand them and check them out closely. 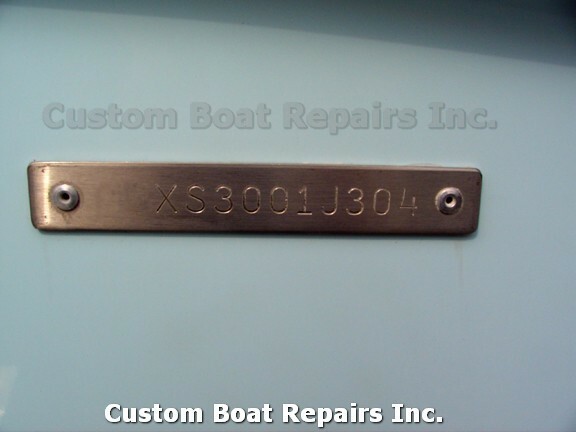 Check out the HIN (Hull Identification Number). This number is usually on the starboard side of the boat below the Rub Rail, right above the swim platform. The numbers should be smooth and rounded and look liked their stamped in the hull. If you see numbers that are scribed into the hull, on the gel-coat,be wary. 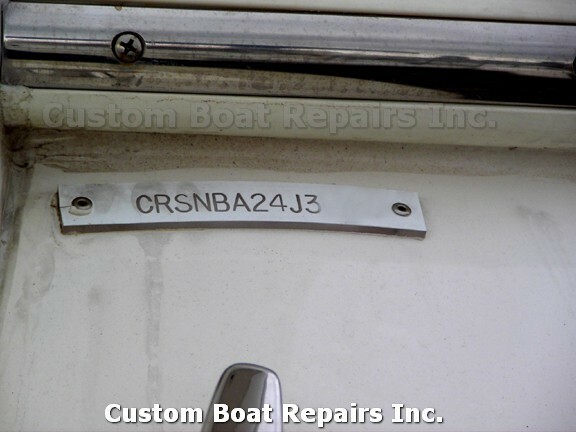 (1) That boat can be stolen and someone could have tried to change the numbers, or (2) a repair was done in that area. 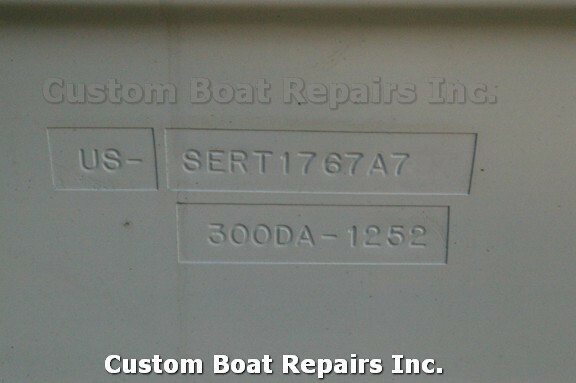 Always check with the manufacturer and give them the number to see if they come up with the same model of boat. Also check the hull numbers with the Division of Motor Vehicles. Next would be the State Police and the Coast Guard. State Police can seize a boat & dry-dock it because the numbers on the boat didn't match the records on the boat. 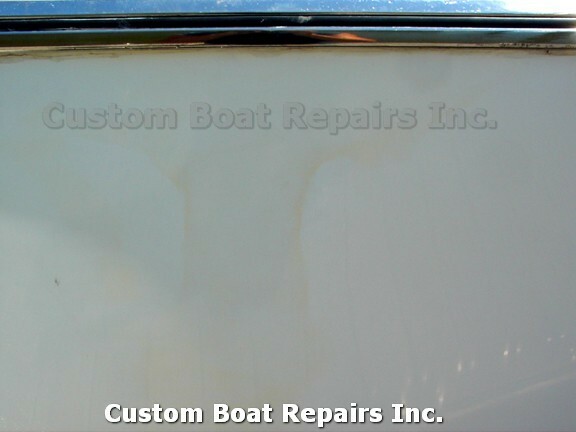 This is what it looks like on some boats when the factory stamps a number in the Gel-Coat on the boat. Some companys will use a plastic tag. Just make sure the numbers and letters are rounded like in this photo. Also I“m not crazy about the screws they use here to attach the plate. Here is a bronze plate another company uses. S/S Rivets hold this one on. Plastic plate with S/S rivets holding this one on. The main thing is if something looks funny or out of place call the factory. Walk around the boat, look at the sides, see if you notice any waves on the side of the hull. A lot of boats come out of the factory with waves, but the waves I'm talking about are roughly 12" to 20" in an area close together. If you see something like this then tap on the side, listen to the sound, then tap on an area few inches away listen to hear if it sounds the same. Companies sell hammers for this purpose, a small lightweight ball peen hammer works well for this test. 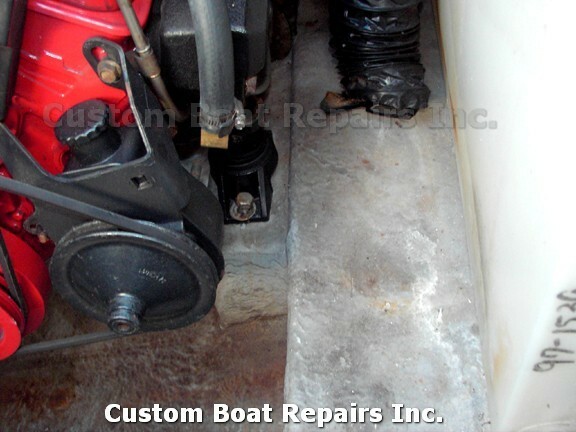 If you hear a dull sound it can be a bulkhead, or a repair area filled in with bondo or delamination. Now check out the Lines on the hull. Most hulls will have a design in the hull that protrudes from the hull. If there was damage this line would be out of shape, if the repairman was good then it would flow with the hull. If their bad then you would have to check the inside of the hull where the damage is to see if it was laid up the right way with fiberglass. 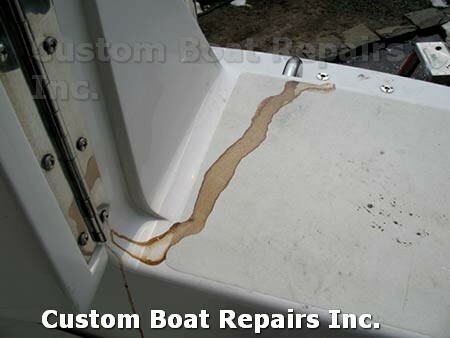 Many boats are fixed with bondo or epoxy with no fiberglass cloth in these areas. Here is a repair that someone else did. The black lines show the Gel-coat was a bad match,the red line show how wavy the line is. Here is a close up of the wavy line. Look at this from the side. See how wavy this repair is. This is what your looking for when I mention the wavy lines. When I see a repair like this on a 60Ft. Boat. This tells me the owner was looking for a fast cheap job. God knows how the rest of the boat is. This is an eye level view. You can see how wavy the line is with the rest of the boat. You have to move around and look at all different angles to spot repairs that they tried to hide. This one was easy. Now look for discoloration in the gel coat. 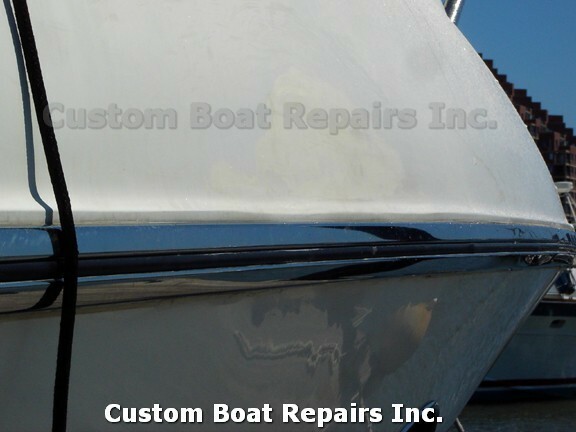 If the whole boat is shiny and you see a yellow tinting in certain areas & some waves in the same areas of the hull, then most likely a repair was done there. Color matching in doing a repair is an art in itself. 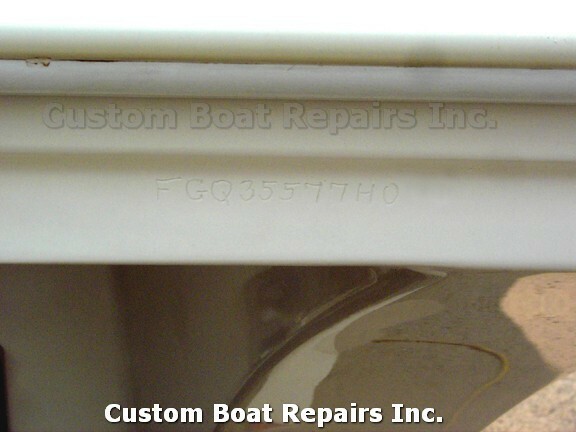 I’ve done many repairs that the boat manufactures could not pick out, when the boat was returned to them for hull warranties. What they don't know is that the both sides where repaired by Bill after a floating telephone pole with spikes in it gouged out the sides. Check out the finish of the hull. Is it smooth & shiny? Or does it have a rough finish? 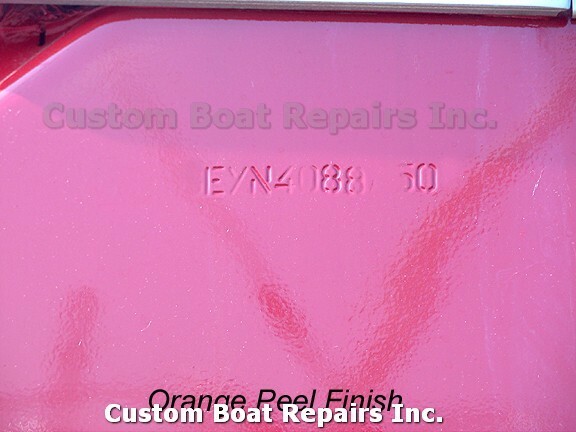 If the finish has an Orange peel look to it then most likely the boat was repaired or just repainted. A good repairman will duplicate the factory finish. This is the side of the hull that was sprayed with gel-coat. This is a bad match. Close up of repair. 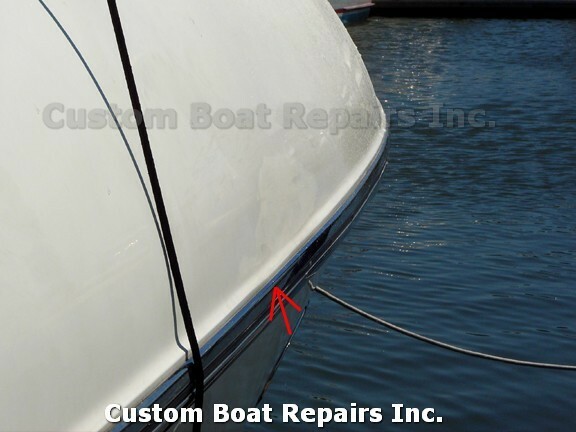 If you look from the side of the boat you"ll see waves by the outline of this repair. The camera couldn"t pick them up because of the glare. This is a Brand New boat that was sprayed by the factory. The owners wanted it red. See the rough Orange Peel look to the finish? In my opinion this is an unacceptable job. If you see something like this on your boat then start checking it out real good. While checking the sides of the hull if you see cracks running vertical of the hull, tap the area and see if a bulkhead is in the area. Now these cracks could be just light stress cracks or that the bulkhead tabbing let go on the inside of the hull. 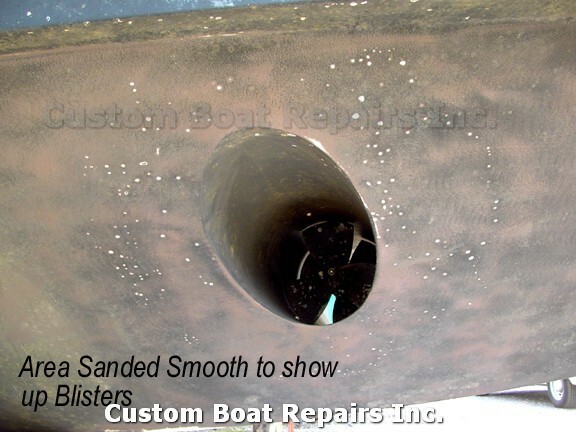 As for repairing that, it could be as simple as just fiberglassing the outside of the hull or ripping the inside apart to fix it the right way. The latter is way more expensive. Its VERY important to fix these cracks. 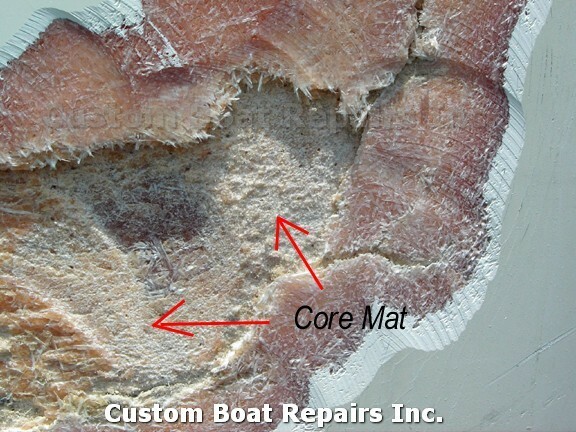 The reason is that the new hulls have a material called Core Mat in between the layers of the fiberglass. Other companies put End Grain Balsa wood. 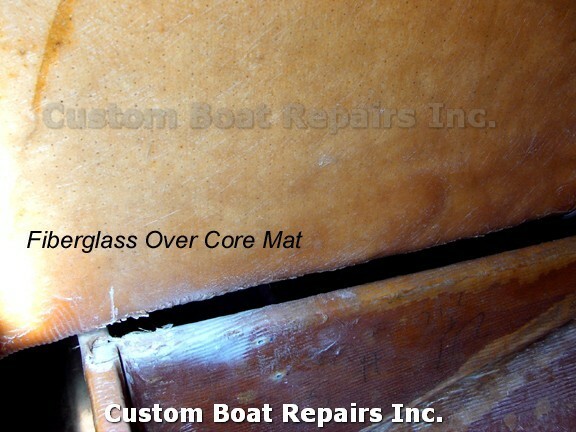 Why its important is that water can get into these cracks soak into the Balsa Wood & Core mat and when winter comes along the water in the balsa & core mat freezes and buckles out the fiberglass. 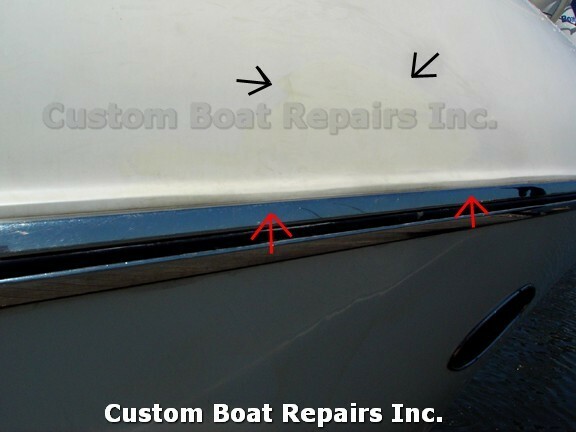 Customers have compounded their boats in the springtime and they notice these big bulges on the side of their hull. After using a moisture meter on the spot it shows the area is wet. 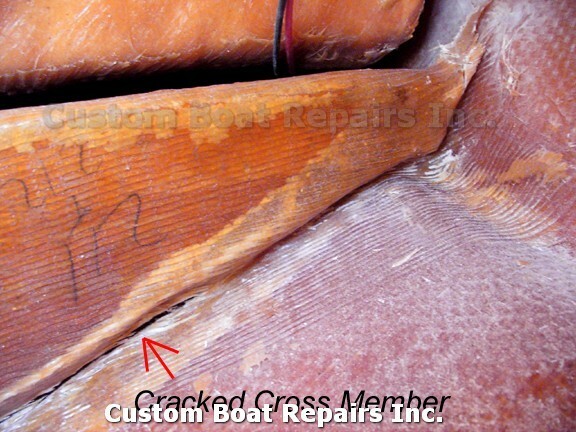 If you can see these Stress Cracks then you should see them on your boat that your thinking to buy. Top deck stress cracks. Very bad. Meaning that these cracks can absorb water and weaken your top deck making it soft. If you walk on the cracked area, it will give & bounce. The same thing can happen to your floor. Here is a moisture meter on a crack. The meter needle is plaster in the red area. Meaning that this deck is very wet. This would be a very expensive repair job. This is a photo of Core Mat. 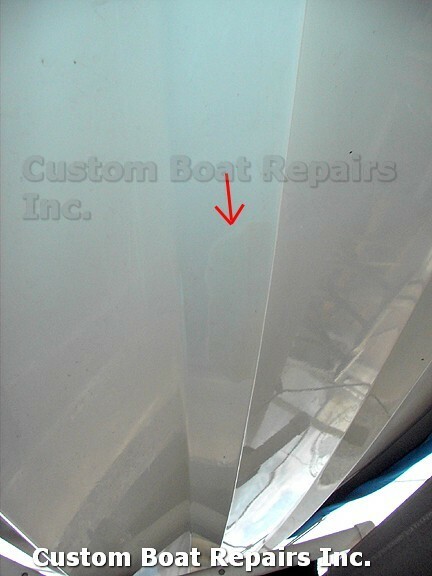 A material in between the fiberglass layers to make the hull lighter. Its white in color and you can see many holes in it. This is core mat in between the layers on the outside of the hull. What happen here is the fiberglass separated from the core mat. The damage area may be small but the separation area is wide. This is End Grain Balsa Wood. This makes the hull stronger from impacts. When it gets wet your problems are just getting started. I"ve seen this stuff get wet and freeze in the winter and buckle out the fiberglass hull. I also seen it rot in between the layers of fiberglass when left wet and alone. Horizontal cracks are usually impact hits. These you'll see by the rub rails on the boat or the side of the boat. This happens when they dock the boat. If you see many of these then you can figure the person wasn't that good at docking the boat and that the boat is a little beat. Push in on these areas and take notice of how much they give. You may also see horizontal cracks at the waterline where the manufacturer butted the plywood floor right up against the fiberglass hull. When you drive the boat the hull gives a little, being that the plywood is butted up close with no room to give you'll get stress cracks on the outside of the hull in these areas. Here are stress cracks by a rub rail. 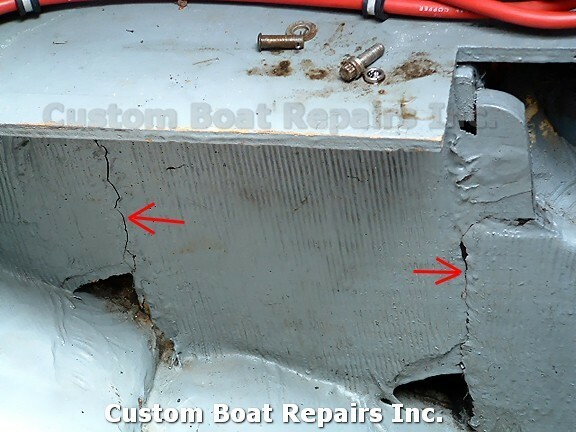 Stress cracks on a top deck corner by transom. 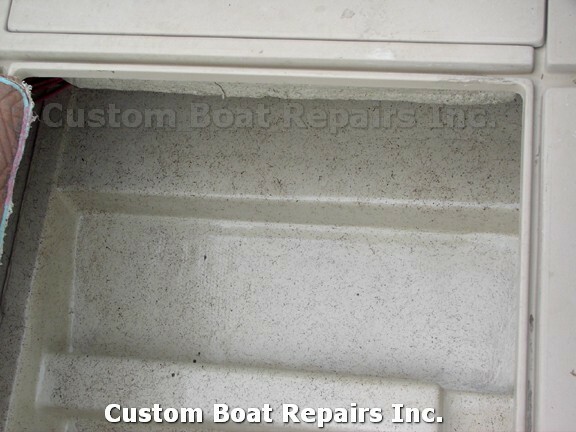 This boat hit the dock on the rub rail and the impact traveled up to the fiberglass causing stress cracks on the side. Next check out the bottom. You have to get down on the ground and on your back. What you don't want to see is water seeping out of the hull. 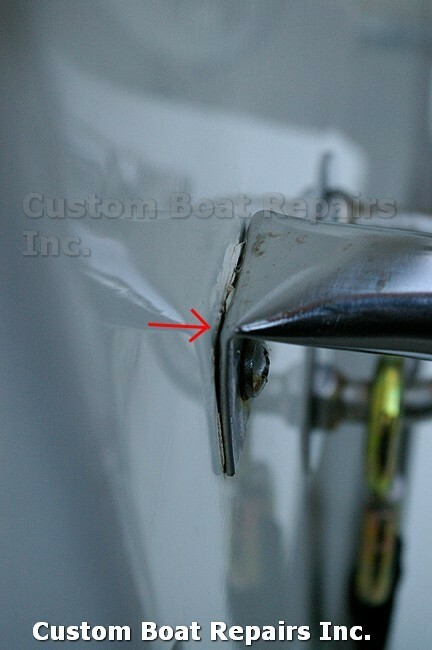 Check out the lifting strakes to see if there are stress cracks on the inside corners. Its best if there is no bottom paint on the hull. If there is bottom paint on the hull you'll see fine cracks in the bottom paint. The movement in the hull will leave some indication in the bottom paint. 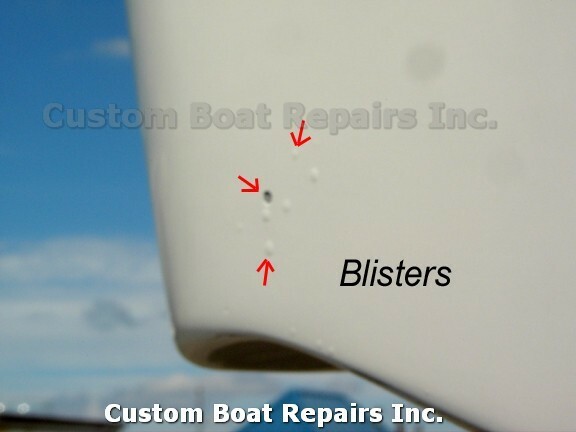 Blisters: They can be anywhere from 1/4"to 2" around, or even bigger, some are even little slits in the hull. From an 1/8" to 1/4" with a slight bump if seen from an angle. 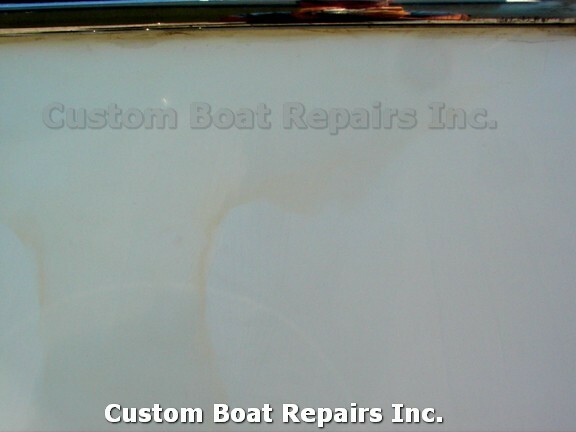 If there is no bottom paint on the boat then they should be easy to see. If there is bottom paint on the hull then you would have to look closely for small bumps. 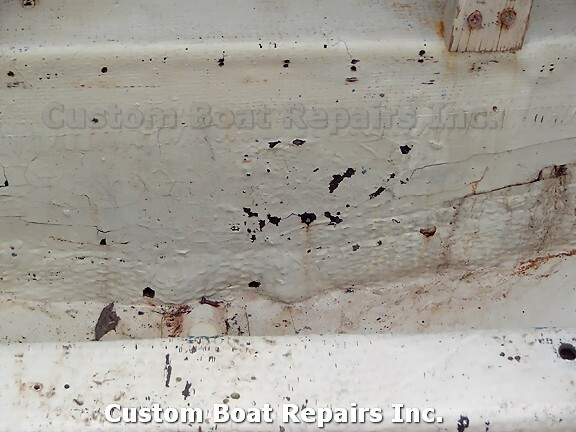 I've seen people put a Fresh coat of bottom paint on the hull to cover these cracks & small blisters up so they can sell the boat. 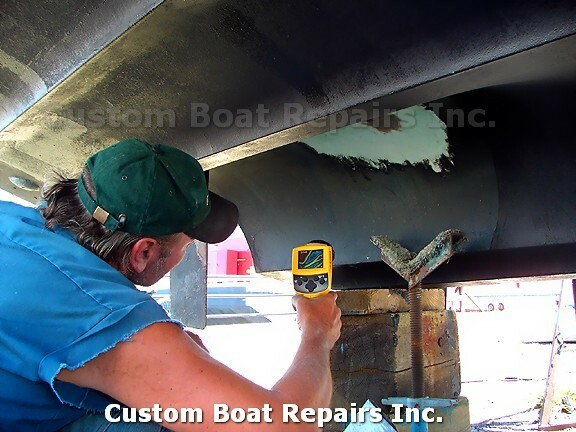 These are the type of things that Bill can find using a Moisture Meter and an Infrared Camera to check the hull out. Damage to the bottom of the hull. See the water stain mark by the red arrow? That's not good. Stress cracks on lifting strakes. A repair on a lifting strake. Bad color match. Another repair on a lifting strake, a little closer with the color but not great. 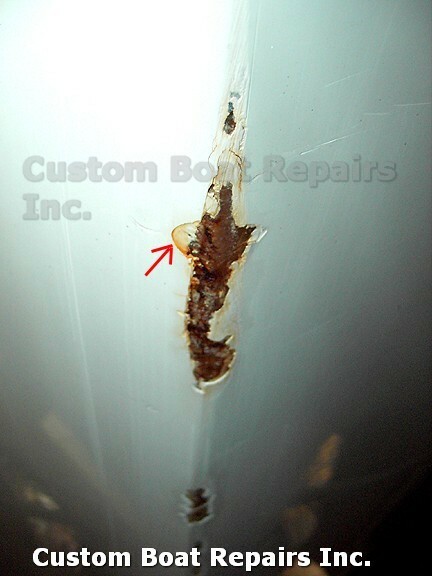 When you see repairs in these areas, try to check the inside of the hull out real good if you can get to it. Blisters on a hull. You don"t want to see these on your hull. 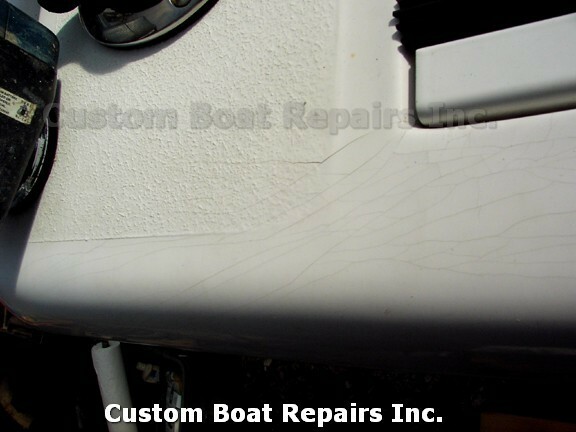 If you brought a new boat and you see remote areas of blisters after you left your boat in the water a few weeks without bottom paint then your boat was most likely repaired at the factory or dealer. 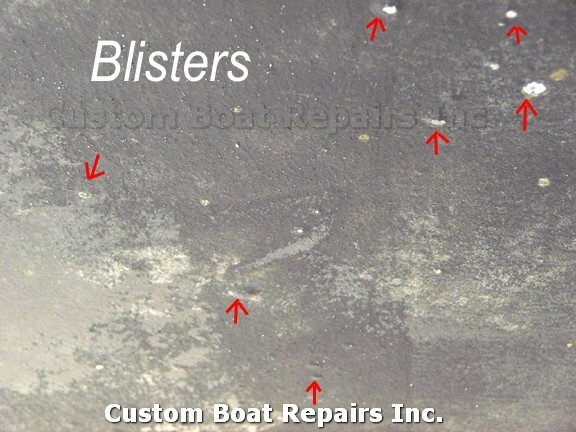 Blisters on another boat that was bottom painted. I sanded the area to show where the blisters are. These blisters where around the bow thruster that the owner had installed. They used the wrong material. Here I'm using my infrared camera to see how far the fiberglass delaminated on this repair job. This is the moisture meter picking up moisture in the hull. Next check out the transom on the outside of the hull. How many screw holes are in the transom? How are they sealed up? Did the sealing pull away from the hull? 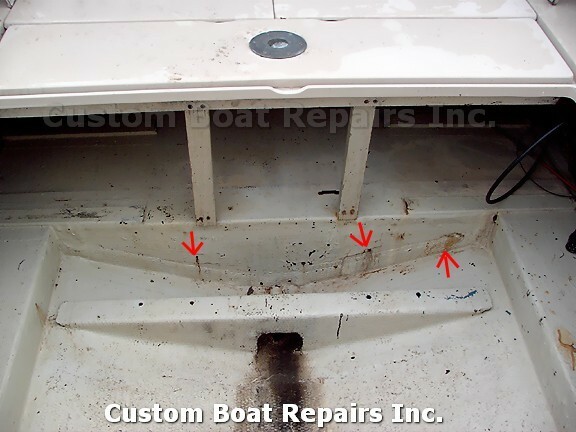 The more holes you have the more of a chance that the transom is wet. 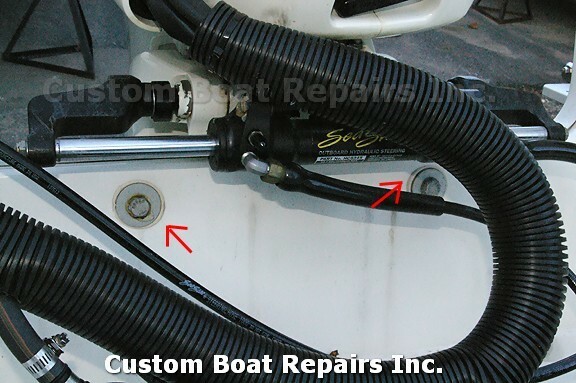 ( Trim tabs, Transducers, Speed Odometers ) A lot of company's & boat owners use Silicone to seal up the screw holes. That's a very big mistake. Silicone breaks the seal all the time and water will seep in. The right material is 3M 5200 to seal screw holes. 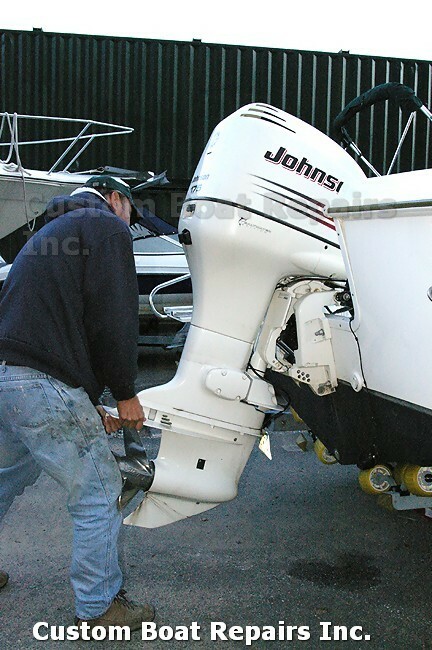 If there is an outboard engine on the boat, look at the inside corners of the washwell. Are there cracks? Most of the time there are cracks. 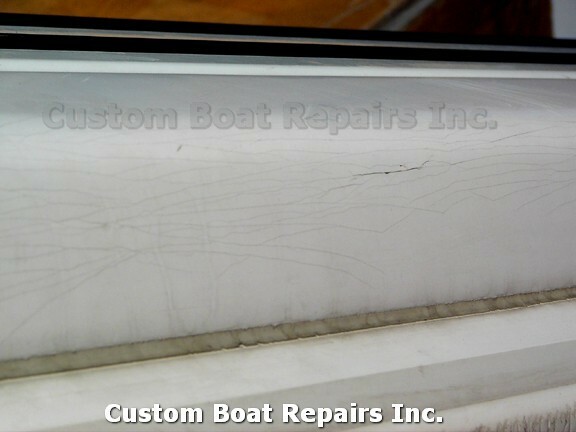 If cracks are there then the transom is most likely wet. This next test will tell you how strong the transom is. Have the engine tilted up. Grab the tail end by the prop and lift it up higher. How much does the transom move? 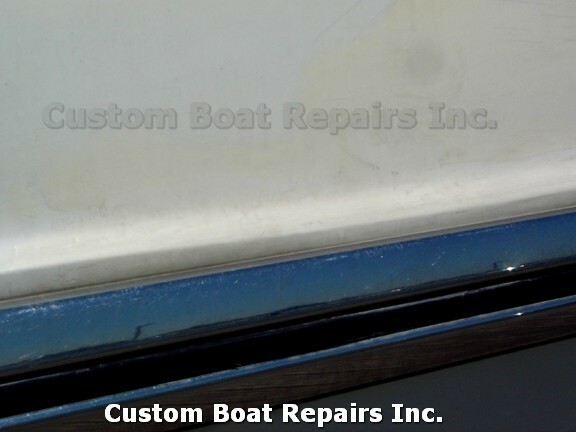 If the transom moves a lot then it has to be replaced. ( Summer time only ) Rotten transoms in the winter do not move at all. Because the wet wood in the transom was frozen solid like a rock and make the transom look great. 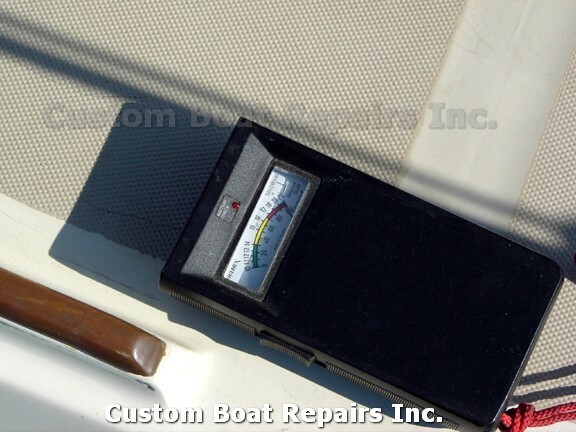 Even a Frozen transom will throw off a moisture meter. 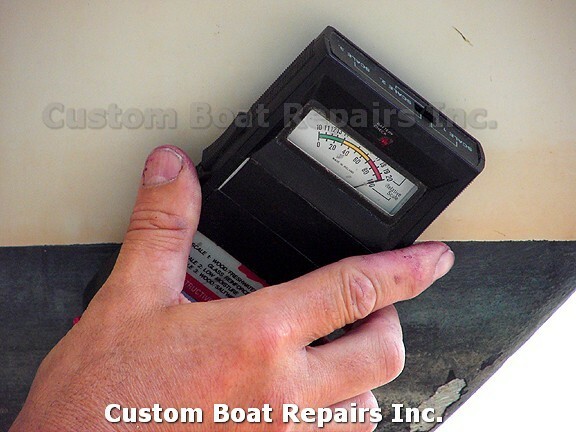 The meter will show that the transom is dry. That's why when checking out boats in the winter you need to use a heat gun. 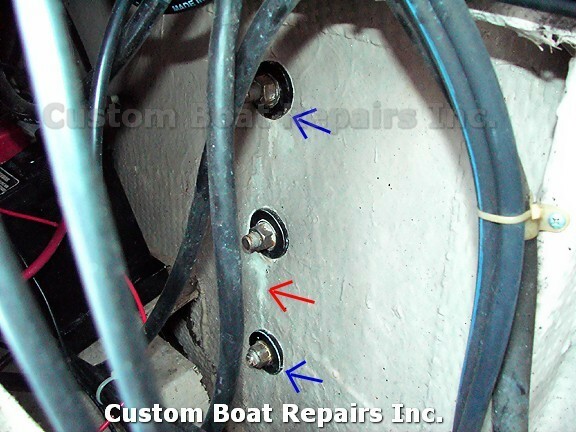 (This is another trick of the trade on dumping a boat ) A lot of surveyors don't know about this. 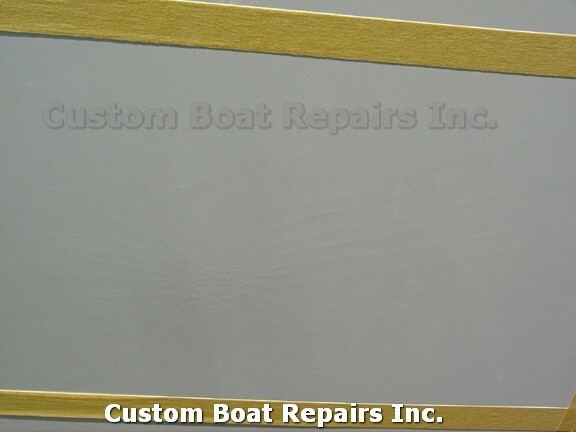 A customer had a boat surveyed in the winter, the report said the transom was great. Bill did some work on it in the springtime and it was very wet. The customer couldn't understand, the boat was never in the water so how did it get wet. 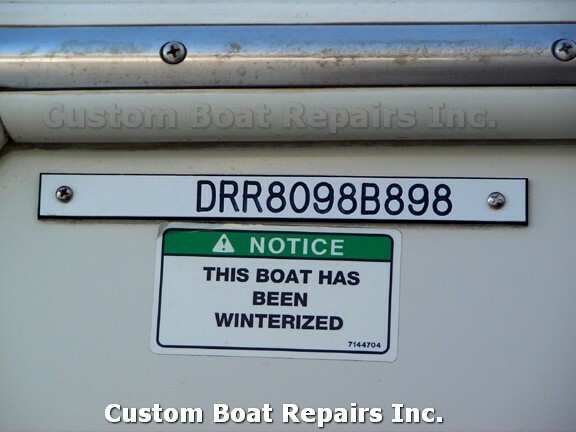 The water in the transom was frozen when it was checked so the meter showed a dry transom. Only when it's wet and warm will a moisture meter show wetness. 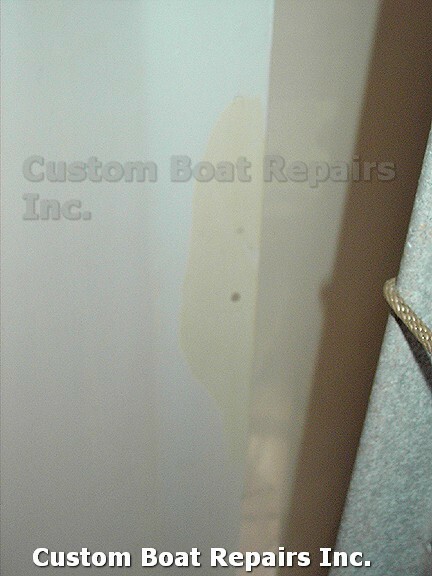 This is a transom that somebody screwed into and used the wrong sealant. It looks good but it peels away from the hull easy. This is where water enters. 3M 5200 it the best sealant for this type of job. Do not use Silicone. This is a bracket for the swim platform. See how it separated from the transom? This would have to be taken apart and redone. 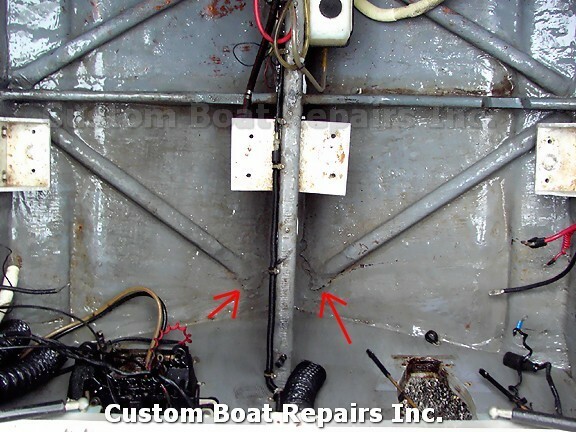 This shows how to check out your transom. Look for stress cracks in the corners. Look to see if the bolts are sunk into the hull. Checking the transom. If the motor is down grab the cavitation plate. Motor up grab the skeg. Note how much it moves. If your still interested in the boat and didn't get turned off yet, lets talk about the topside of the boat. Climb into the cockpit area, put your two feet together and move up & down with your body weight, not jumping just good pressure. Does the floor give? Do this all around the cockpit area, front deck area, gunwale areas, this is VERY important. If there is any movement, where you feel the floor giving more then a half-inch up & down, then the floor or deck area could be wet & rotting. The floor or deck area would have to be replaced. But this repair can go beyond the floor and to the stringer system. Reason why is that some company's use big metal spikes to attach the floor to the stringer system, they rot out and the water travels down into the stringer and that starts to rot too. 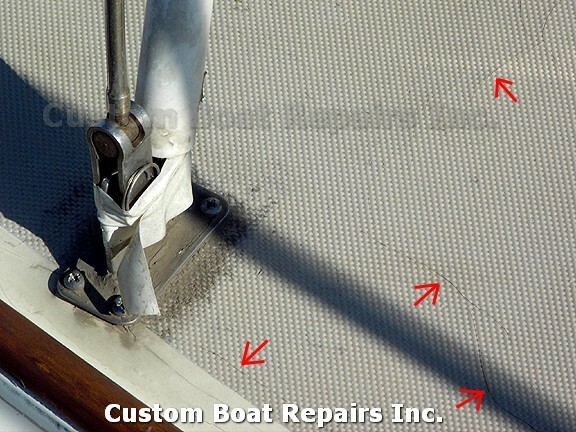 On the newer boats an adhesive is used to attach the floor to the stringer assembly. Next look on the top decks & non-skid surfaces for circle shape or straight lines stress cracks. Stress cracks on non-skid surface. Long lines. 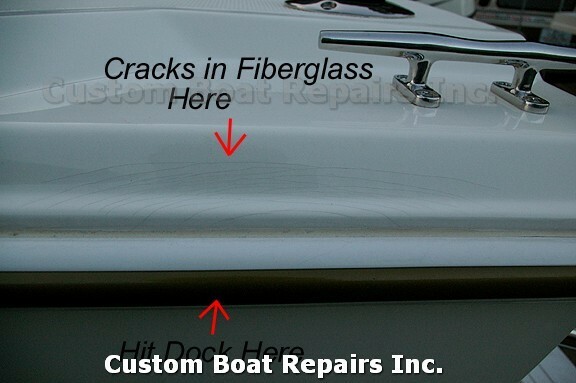 If you see these many stress cracks on a non-skid deck it can be very expensive to fix them. 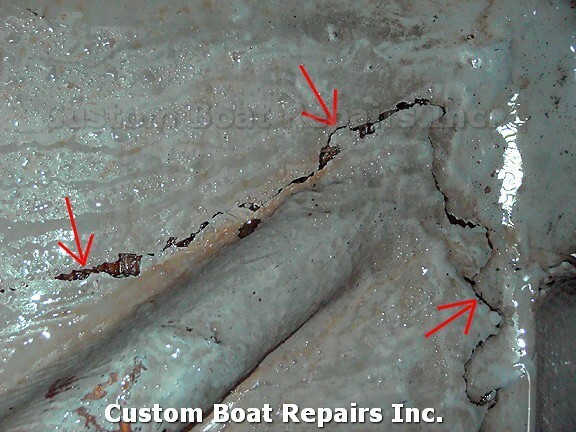 If the cracks read moisture I tell my customers to find another boat to buy. If you see stains like these coming out of stress cracks or screw holes then the wood behind the fiberglass is already rotten. Close up of stain coming out of a screw hole hinge that's holding on a transom door. You still with me? 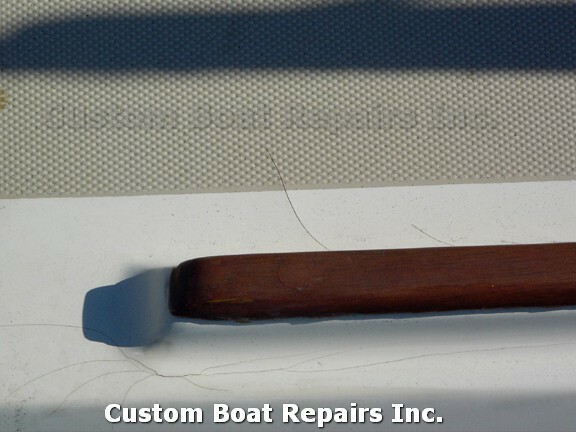 Check Bow rails if there loose, hand rails, see if the seal between the deck and hull is in tack. 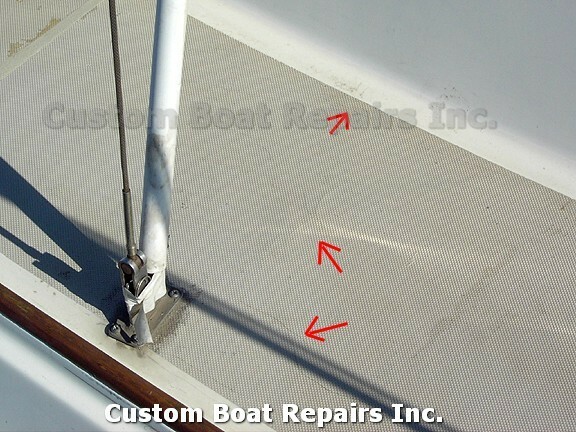 If not then most likely that's an area for water to get into your deck and then create a leak into the cabin. Next open the engine covers. Get down into that compartment. There you'll see the inside of the transom. 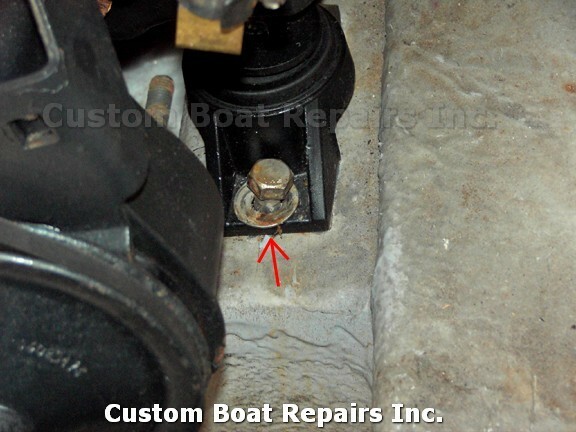 If there are bolts on the transom like for an outboard or for mounting the outdrive, look at them closely to see if the bolts are sinking into the wood. If they are that would mean that maybe the wood is soft and rotting or a gorilla tightened the bolts up when the parts where installed. This next test will tell you which one. 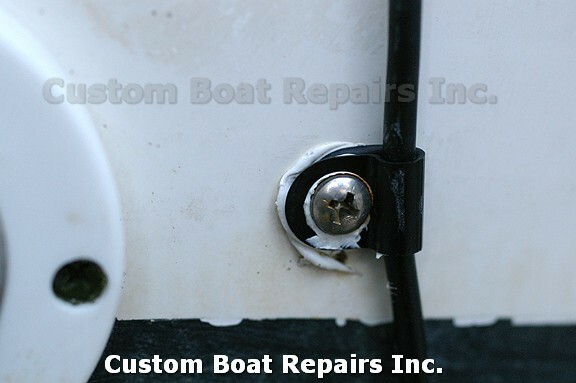 Usually on the inside of the transom there are many screws holding things on the transom. 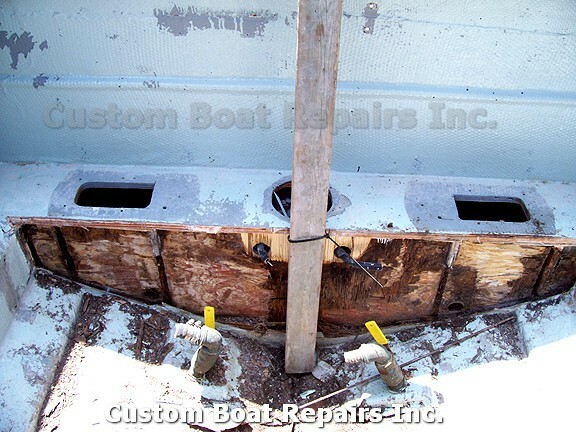 You will have to remove a couple of them starting from the bottom of the hull working to the top of the inside transom. Now you'll need an Ice Pick. Stick the Ice Pick into the screw hole, if the ice pick goes into the hole over an inch then the wood is rotting. You'll be able to tell, it's a feel thing. You can stick a good piece of plywood and see how far the pick goes in, then stick the transom and see how far it goes. ( Note: Make sure the hole is bigger then the ice pick tip, Or the fiberglass will mimic good plywood while inserting the pick into the wood.) 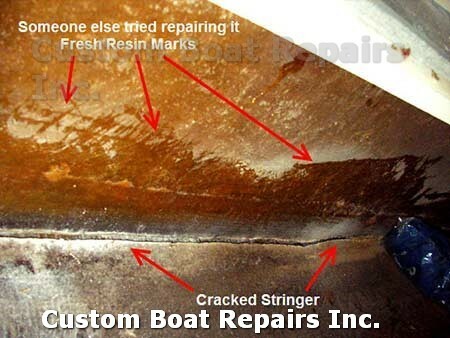 This test will only tell you if the transom is rotting. But the transom can still be wet. Only a moisture meter will tell you if its dry or not. 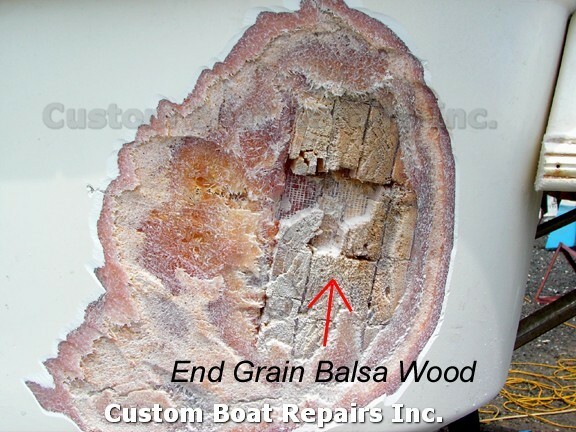 You can also drill a big hole in the fiberglass and do a visual inspection of the wood, but since it's not yet your boat this is probably a bad idea. This is an inside view of the motor mounting bolts. 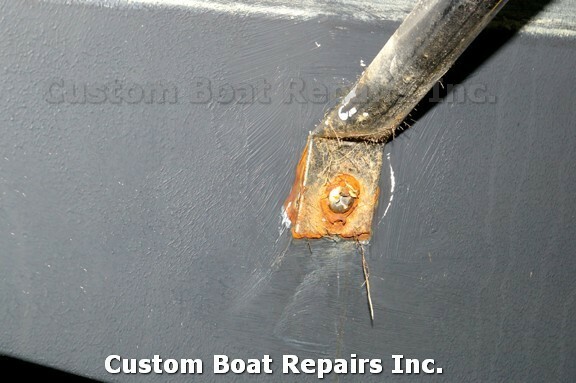 The red arrow shows a water stain mark and the bolt is sunken into the transom. This transom is wet. Next the engine mounting blocks. Look at the Mounting blocks closely. Does the fiberglass look even over the whole block? Are there any suspicious holes that where covered up? Many people use Git-Rot to strengthen the motor Mounting Blocks when there rotted out. That's the wrong way to fix it and very dangerous. A Customer bought a boat from someone that did this to his boat. 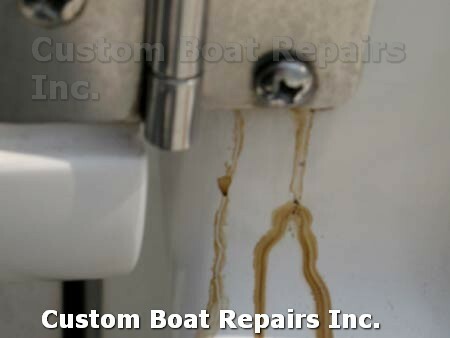 When the customer took the boat out to the Ocean it started to leak. 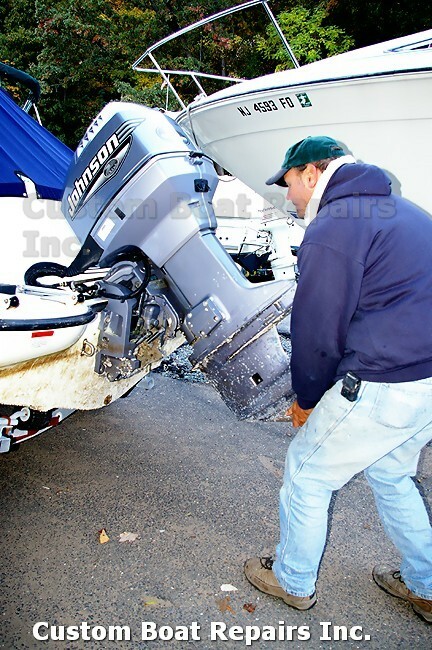 The motor jumped off the mounting blocks and broke the seal of the outdrive on the transom and the boat started to take water on. He found a sandy beach to run the boat up onto before it could sink. He sued the seller of the boat and won triple damages. Now look for screw holes on the mounting block. If there are no holes then you will have to remove one of the engine mounting bolts that's screwed into the timber. Next stick that timber with the Ice Pick. How does it feel? How far does it go into the wood? If it goes in then most likely its rotten. This is the inside of the engine compartment. Check out the mounting blocks and side panels. This bolt holds the engine in place. Pull the bolt and stick the wood with the ice pick here. Here is the other side of the compartment. This is the center mounting blocks. Pull a bolt here and pick the wood. Looking at the top of the mounting blocks should be smooth with no holes in them. Just the holes to mount the engine. If you see small drill holes that are cover up, then someone put a liquid material on the timbers to harden the rotten timbers back up again. Walk away from this boat. Next check out the Bulkhead in front of the engine with the Ice Pick. 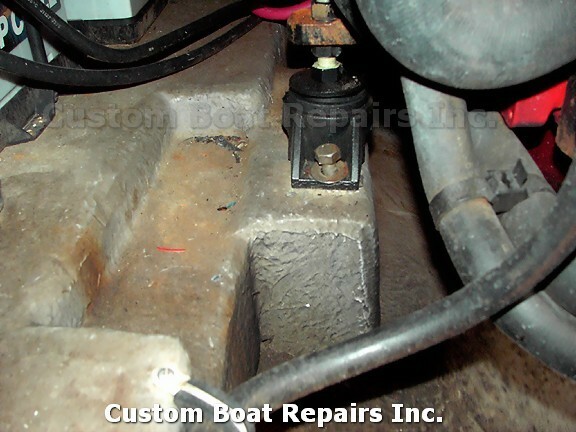 On most boats this bulkhead separates the fuel tanks from the engine compartment and gives the hull some strength. Is it soft? Next if the engine compartment area is covered with white gel-coat, look for a light water stain mark on the gel-coat. If you see these marks that can tell you that the side compartments may be holding water and its seeping out. Check for cracks in the bulkhead and floor supports. Look inside the engine compartment. If you see water stains on the sides where the red arrows are, then there is a big problem with the boat. Here is a close up of the stains. This is a bulkhead that separates the fuel tank from the engine compartment. As you can see its rotten. Open the access panel for the Fuel tank. Most boats have this to change the sending unit. Are the tanks set in place with Foam? Do you smell Fuel? 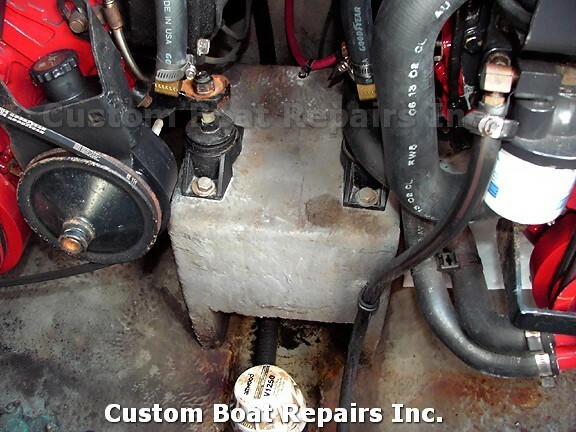 On older boats the fuel tanks where set in Foam. If the Foam got wet it would corrode the aluminum and make the tank porous. Then the fuel would leak out into your bilge, if a spark was present the boat would blow up. Next if the boat has a cabin, go inside and pickup the access floorboards. Look inside see if the fiberglass is in-tack. Look for the stringers that are attached to the hull. Check the bulkhead tabbing to see if its still in-tack. 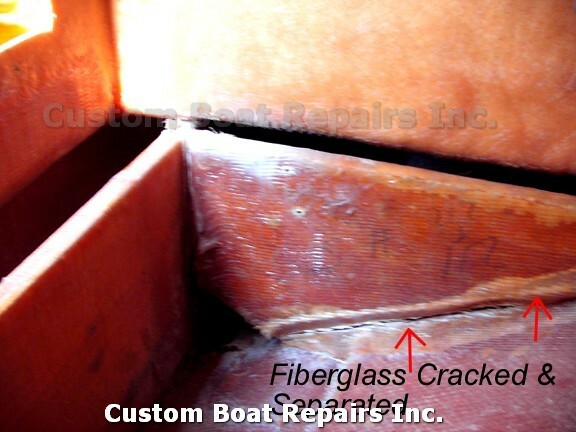 If the fiberglass is separated that can be a problem. Sloppy Fiberglass work from the Factory. When you see this you need some serious work. Wood Inside of Stringer Rotting. Riding the boat and not repairing it leads to this. This is ready to let loose & sink. 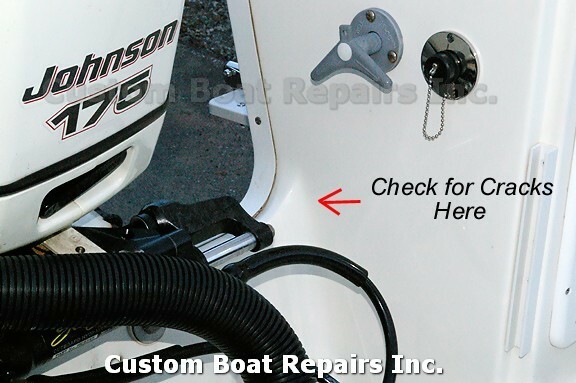 The tips you have read above are the most important parts of the boat to check out. Structural Integrity. The hull being sound when hitting the waves. Mostly it's Common Sense. If it looks funny, or out of place then investigate it further. It's the difference of either enjoying a ride back to the dock and swimming back to the dock. Next the Engine. Bill can't help you here. 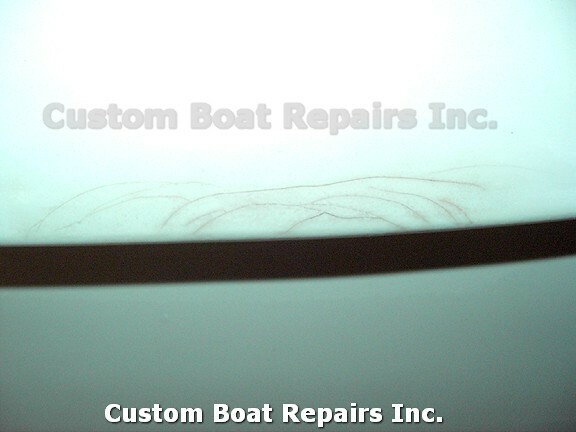 Custom Boat only specializes in Fiberglass. Look for a good mechanic to go over the Engine, Drives, and Electrical System.